Joanie Bellistri received an important Maryland state award this year. She was one of the inaugural recipients of the Maryland Access to Justice Commission’s Maryland Access to Justice Awards. “These awards recognize individuals, programs and entities in the State that improve the ability of all Marylanders to access the courts or to get legal help in civil legal matters so they can benefit from the rights, protections, services and opportunities that the law provides,” said retired Maryland Court of Appeals Judge Irma S. Raker, chair of the Commission. Joanie was awarded the Judicial Branch Excellence Award “for her ongoing efforts to make legal information more accessible through publications, training and programs such as the creation of a self-help corner in the court’s law library. 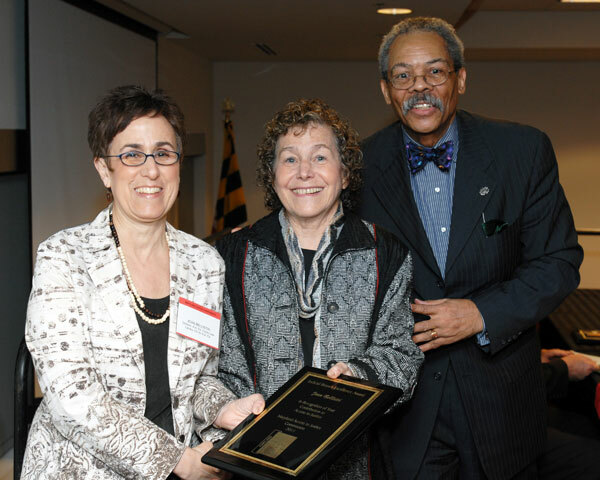 [She] also created the ‘Ask a Lawyer in the Library’ program in Anne Arundel County, organizing attorney volunteers to staff regular clinics at local public libraries.” Joanie received her award at the 2011 Judicial Conference on May 13 in Annapolis. She was in good company. Other honorees included Gov. Martin O’Malley, winner of the Executive Branch Award, and Chief Judge Ben C. Clyburn of the District Court of Maryland, winner of the Judge of the Year Award. This entry was posted in LLAM Announcements, Member News by LLAM News. Bookmark the permalink.